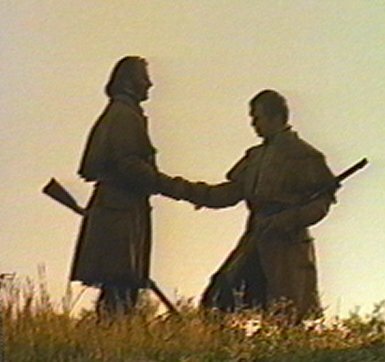 Clark and Lewis shake hands for the last time in a scene from National Geographic's "Lewis & Clark: The Great Journey West"
Last week, when we were talking about Meriwether Lewis Clark Jr. and the founding of the Kentucky Derby, Rebecca of My Adventures in History brought up the interesting question of Lewis and Clark’s friendship after the Expedition was over, and how William Clark reacted to the violent death of Meriwether Lewis just three years after the explorers returned home as heroes. This is a question I have spent years thinking about, and it forms the principal plotline of our novel To the Ends of the Earth. It is difficult to imagine how any two men could have been closer than Lewis and Clark during the years they spent exploring the wilderness. They could have written the book on heroic friendship, an ideal permitted to men in those days. Together they shared responsibility for more than 30 lives, the most extensive exploration ever undertaken by the United States (comparable in its day to a journey to the moon), the almost laughably high expectations of President Jefferson in terms of data they were expected to collect, and incidentally the claims of the United States to the North American continent. By all accounts the partnership, while an unorthodox military arrangement, performed beautifully. Lewis was just 29 years old when the Expedition left St. Louis, and had many assets that had won the trust of President Jefferson for such a critical mission. Besides being a talented woodsman and crack shot, he was a good writer, a natural (if hastily trained) scientist, obsessive in his powers of observation, audacious, self-disciplined, ravenously curious, and politically and personally loyal to Thomas Jefferson (never the least consideration in Jefferson’s book). Lewis was also unique in a way that Jefferson probably never understood. Lewis was capable of understanding, acknowledging, and compensating for his own weaknesses. What were they? He was vain, hot-tempered, and a loner. He was subject to tormenting mood swings that ranged from incredible bursts of energy and improvisation to self-doubt and despair (some historians believe he was manic-depressive). He had little experience navigating powerful river systems. He lacked an understanding and empathy with the Indian mind. Because of this self-insight, Lewis recruited William Clark, an old friend from his earliest days in the Army, to serve not as an assistant, but as co-commander. Lewis did this entirely on his own initiative; Jefferson couldn’t have cared less about Clark. Thrilled by the opportunity, Clark threw himself into his work. Clark trained the men into a cohesive unit that functioned with remarkable harmony, dignity, and grace. With his deep and intuitive understanding of river geography and topography, Clark handled innumerable crises with the boats, created the Expedition maps, and freed Lewis up to walk on shore and do biological field research. Clark genuinely liked Indians (except for the Teton Sioux) and brought a respectful and outgoing vibe to the Expedition’s diplomacy. Clark understood women and made a lifelong friend of Sacagawea. Even British traders, at that time enemies of the United States, found themselves liking him. Not least — and not coincidentally — Lewis had chosen a partner who was brave and relentlessly determined, yet willing to subordinate his own ego to a larger cause and a larger ego. Friends will go hungry for each other, freeze for each other, die for each other. … At its height, friendship is an ecstasy. For Lewis and Clark, it was an ecstasy, and the critical factor in their great success. After the Expedition, Lewis and Clark were welcomed home as heroes by the public and a president who had all but given them up for dead. It was only natural that they go their separate ways for a while. Clark was a very focused and results-oriented person, and he was determined to parlay his success into the personal happiness and financial security that had eluded him when he was younger. He headed for Fincastle, Virginia, where he began a courtship of the very beautiful, very young, and very rich Julia Hancock. The two were married January 5, 1808, not long after Julia’s 16th birthday. Or so it seemed at first. The demands on Lewis were different than those on Clark. He was Jefferson’s man. Just being a tough soldier-explorer and a hero wasn’t enough. He was expected to be a politician and handle the snake pit of land claims and international intrigue in the new territory. He was expected to be a writer and produce a book on the Expedition. He was expected to be a scientist and work with the finest minds in Philadelphia to record data and preserve specimens. He expected himself to find a beautiful and well-connected wife, but somehow, he couldn’t make anything work. 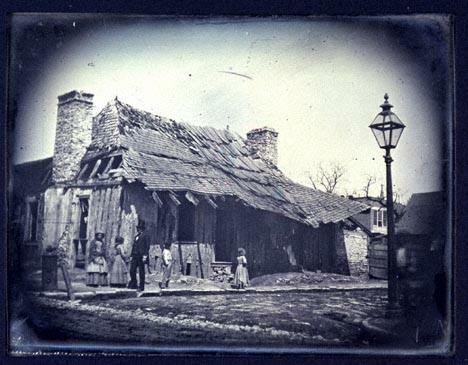 The house where Meriwether Lewis, William Clark, and Julia Hancock lived in St. Louis, shortly before it was torn down in the 1850s. Located on the corner of Spruce and Main, it was home to two other territorial governors, James Wilkinson and Alexander McNair. Courtesy Missouri Historical Society. As before, he turned to Clark, and the two of them made plans to live together. Lewis went house-hunting in St. Louis and found a small house that he arranged to share with Clark and Julia. Reading between the lines, I don’t think Julia was adequately consulted on this plan. Lewis got his own place in short order, but he and Clark worked together very closely during Lewis’s brief governorship. Lewis, a prickly military man at heart, was not malleable enough to suit many of the powerful men of the territory, and struggled in particular with a poisonous relationship with Frederick Bates, the territorial secretary (it took every bit of Clark’s patented personal diplomacy to avert a duel between the two men). On January 10, 1809, Julia gave birth to a son, and the baby was named Meriwether Lewis Clark, a testament to Clark’s esteem for Lewis if ever there was one. Lewis must have been happy about the baby, but personally something was wrong. Historians disagree on what combination of factors began to overwhelm Lewis; perhaps a perfect storm of political, financial, physical, and mental disasters. In August, he left St. Louis to travel to the Federal City (Washington) to answer charges of official wrongdoing leveled against him by his boss, Secretary of War William Eustis. Clark was outraged about how Lewis was being treated. He was also worried about Lewis’s mental state. 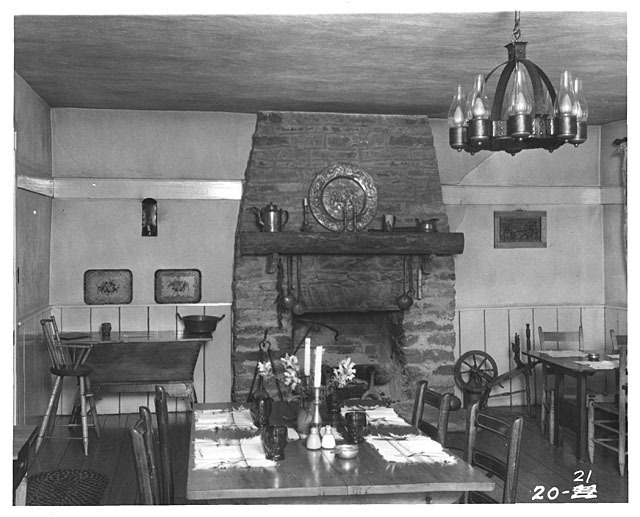 Interior of the Cross Keys Tavern in Shelbyville, constructed about 1800. This may be something like the tavern in which Clark wrote his first reactions to Lewis's death, explaining, "Parden this hasty Scraul which is written in a room Crouded with different descriptions of people. Some drunk." Courtesy Kentucky Historical Society. I Saw in a Frankfort paper called the Arguss a report published which givs me much Concern, it Says that Govr. Lewis killed himself by Cutting his Throat with a Knife, on his way between the Chickaw Saw Bluffs and nashville, I fear this report has too much truth, tho’ hope it may have no foundation — my reasons for thinking it possible is founded on the letter which I recved from him at your house … I fear O! I fear the waight of his mind has over come him, what will be the Consequence? This raw passage is one of the strongest pieces of evidence for those who believe that Lewis committed suicide. The man closest to him in all the world believed it. The letter Clark refers to has never been found. We arrived here this evening all in the Same State of health we were when we parted with you, but not in the Same State of mind. I have herd with the Certainty of the death of Govr. Lewis which givs us much uneasiness. Clark could think of nothing else but the death of his friend. 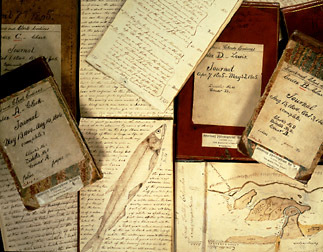 He was also very worried about the journals of the Expedition, which Lewis was carrying with him when he died. Clark knew that if the journals were lost, stolen, or destroyed, it would be an irrecoverable loss. In many ways, it was be as if they had never gone on the Expedition at all. I am at a loss to know what to be at his death is a turble Stroke to me, in every respect. I wish I could talk a little with you just now. 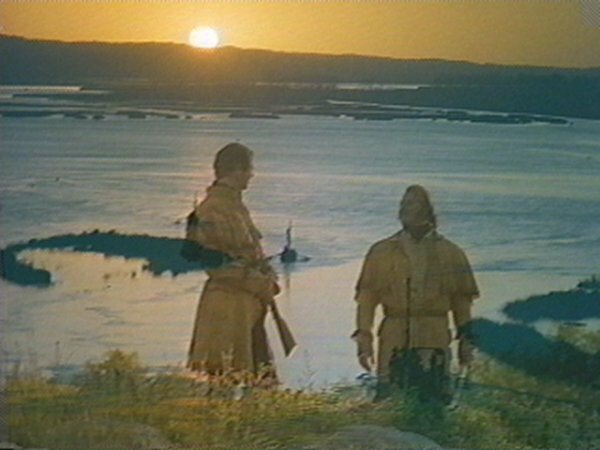 Lewis and Clark stand as fading memories in this scene from "The Great Journey West." his servent reports that on his way to nashvill, he would frequently Conceipt that he herd me Comeing on, and Said he was certain [I would] overtake him, and would come to his releaf. After the initial shock and grief of Lewis’s death passed, Clark very rarely spoke of it. A nephew who was close to Clark in his later years wrote that his uncle did speak with great fondness about the Expedition and about his old friend — but never without tears in his eyes. This is a stunning contribution to midwest history and the accomplishments of these two men. Thank you so much. I imagine that Clark had a difficult time with Lewis’ death, since they were pretty close and had shared the experience of their expedition. It’s really interesting to me that we still don’t know what happened to Lewis at the time of his death, but Clark believed it was suicide. Great post! I hope I’m able read “To The Ends of the Earth” sometime. I was responding to an entry on ancestry.com for Julia Hancock Clark (saying she was born Judith Julia Hancock) and since I believed she did not bear the name Judith, I did some research. William and Julia were my gr gr gr gr grandparents and my grandmother, mother and uncle are buried near Clark in the family plot here in St. Louis. I fell upon this entry. I have read the various theories of how Lewis died and this was new. In addition, to my great surprise, Meriwether, William and Julia lived in a house that was located just a few blocks from where I live now. And St. Louis is not my hometown, but a city I moved to as an adult. I will have to to travel to Spruce and Main and see the space. I always wondered where Clark and his family lived here in St. Louis. A wonderful find. The Internet can be a source of great treasure. It was so great to hear from you! On our visit to St. Louis a few years ago to do research, we visited your family plot. I was touched by the number of recent burials and by the fact that servants were buried in the plot as well. I do wish that more had been preserved of early St. Louis, but we did go and stand in the physical space of Spruce and Main as well. Julia is one of the main characters in To the Ends of the Earth and we loved writing about her! Who doesn’t enjoy a “how we met” story? There is a charming story about how William Clark met his future bride, Julia (Judy) Hancock, a year or so before the Lewis Clark Expedition. Hancock family legend has it that Julia and her cousin Harriet were out riding near their handsome family home, Santillane, in western Virginia. The girls were having trouble getting home when one of their horses became balky. Along came a handsome red-headed gentleman, William Clark, who helped the girls get the horse going and escorted them home. Little did the pretty young girls, ages 12 and 14, dream that they had both met their future husband. Julia’s father, Colonel George Hancock, was known as a tough SOB. Hancock was the largest landowner in Fincastle and Botetourt Counties and had served two terms in Congress. When he died in 1820 (sadly, about the same time Julia died), he is believed to have been buried in a sitting position in a marble chair in the family mausoleum in Fincastle (which is also where Julia is buried). This way, he could “look down the valley and see his slaves at work.” Nuf ‘ced. 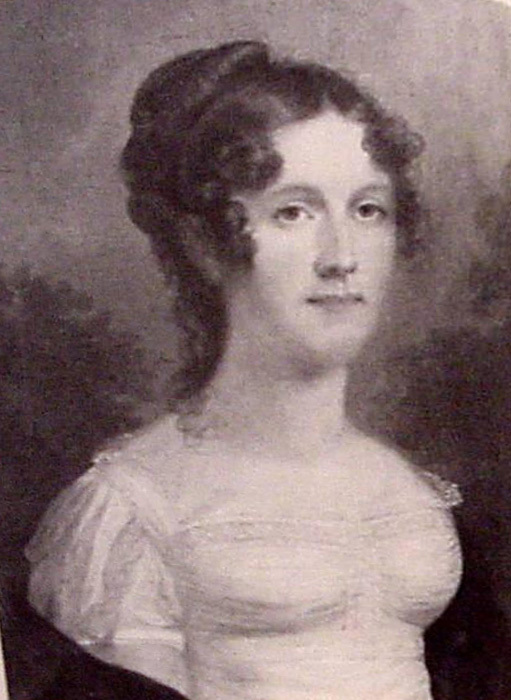 Colonel Hancock’s daughters were highly sought-after Virginia belles, and it wouldn’t have been unusual for William Clark to express his interest in Julia to her father despite her young age. Women of the gentry class on the frontier were often married off very young in those days after fierce competition from multiple suitors; Clark’s own sister, Fanny, known as the “black-haired beauty of Louisville,” was married at age 14. It appears that Colonel Hancock did not give his permission to Clark to court young Julia right away, but that he did note Clark’s interest and made it clear that if Clark could establish himself financially (something Clark had yet to do despite being past 30), the Colonel would look favorably on his suit. Not the least of William Clark’s incentives for joining Meriwether Lewis on the Expedition would have been the opportunity to secure fame and fortune so that he could have a fighting chance of winning Julia for a wife. There is evidence that he thought of Julia during the Expedition with the naming of the Judith River in her honor. What is undisputed is that Clark made a beeline for Fincastle County upon his return from the West and began courting Julia. They were married in early 1808. Julia was 16 and Will was 37. By all accounts the marriage was a happy one. Julia died quite young in 1820, leaving behind her husband and five children. Historians are not completely sure what her illness was; theories include tuberculosis and breast cancer. Not long after, Will married Harriet Kennerly Radford, Julia’s cousin and companion on that long-ago day when Clark rescued the girls from the balky horse. By this time, Harriet was a widow herself with three children, her husband having been killed by a wild hog on the Kentucky frontier. Life was rough in those days! Will and Harriet had two children together. One challenge we faced in creating the character of Julia for Ends was dealing with the “ick” factor about the age difference between Will and Julia. We finally decided to just explore these characters with as much compassion and insight as we could and let the chips fall where they may. We ended up loving the way this part of the story turned out; it brings a tenderness, humor, and drama to the story that would not otherwise exist. Judith Julia Montage, it appears we are related. I just stumbled onto this wonderful blog today. I’d love to know how you are related as there were several siblings and I am buried in the family geneology and trying to tread water. I have an answer about the Judith Julia Judy question. Julia was baptised Julia. She was never called Judith. The problem started with my ancester George ( related to both Julia and Harriet). As a child George couldn’t pronounce Julia and called Julia “Judy.” The nick name stuck. This story has been passed down through the Hancock Kennerly and Menard families. Hi! I was just on ancestry yesterday – you can get lost in that stuff, but looking at another part of the family tree. Interesting re the Judith Julia Judy issue. Ironically, my own mother Julia Clark Jones was unaware that Julia Hancock’s nickname was Judy and named me Judith after Judy Garland! But Mother was named for Julia Hancock and also Julia Voorhis. My line from Clark is: William Clark/Julia Hancock through their son George Rogers Hancock Clark/Ellen Nellie Glasgow then thru their daughter Seddie Clark Lauderdale/Wilmot Edward Ellis through their daughter Dorothy Ysidra Ellis/Charles Rouse Jones through their daugther (my mother) Julia Clark Jones/John Burns Hull. I’ve got one of the Julia Hancock oil portraits over a fireplace mantel here at home. And have a copy of Julia Clark Voorhis’ will from 1920 which is interesting in terms of persons mentioned and it also disposed of some of Clark’s possessions. My tree is on ancestry.com if you want to take a look. I used to take original Clark writings to show and tell as child before the govt came and asked for them to protect them for history. Awesome comments. We love our Clark family genealogists on this site.